Well the carpet cleaning day in San Diego Ca. started off a little grey and bleak today. The rain was out and I got my first cancelation of the day before 8am. But I knew we would still have a great day cleaning carpets today. We were scheduled to clean for a long time client in Pacific Beach, San Diego Ca. 92109. She has 2 beautiful Golden Retrievers that are always happy and playful, but as every dog lover out there knows. Our pets always do a number on our carpets. The pet oils, hair, dander etc makes our pretty white carpets look grey and dingy. Well that was the situation in our client’s home. She has a Berber carpet that was cleaned exactly a year ago. Her babies left there mark on the carpets, large black spots that were resoiling and driving her crazy. So her hopes where left in our hands. She knew that our green and zero residue steam cleaning would remove the oils, soil, and dander and leave her home fresh and clean again, just like we did last year. So after a thorough walk thru, quote and a few laughs Christian and I were ready to start the carpet cleaning. As always we pre vacuumed the carpets we were going to be cleaning and then moved the furniture that was asked of us by the home owner. 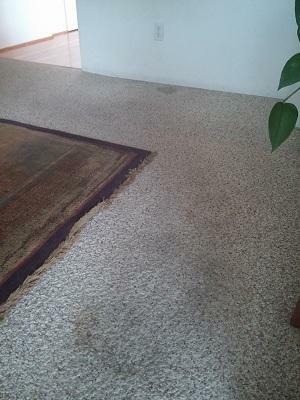 The spotting and preconditioning with our Alkaline water was then applied to the soiled carpets. This water is amazing! It is our main cleaning agent, No Soaps, No Detergents, an amazingly Green and Organic Steam cleaning system that leaves zero sticky residues left in the carpets, yet cleans the all the carpets perfectly. I do have to give credit where credit is due. Using the Hoss 700 rotary extractor is also a huge part of our cleaning service. But I will leave that for another post. Anyhow, the carpet cleaning process took approximately 2 hours and the end results were exactly what our client was hoping for. Her carpets looked like new again, oh and by the way these are 10 year old carpets. Well that is just one of our stops today. Just goes to show that even if the rain comes out in San Diego carpet cleaning doesn’t have to stop. 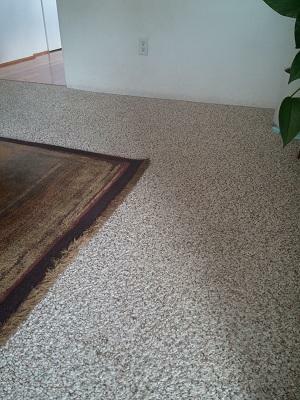 We always can get them clean and dry quicker than many other carpet cleaners in our beautiful city.